Here are some of the most interesting and fun facts about gold. There is more steel created per hour than there has been gold dug up throughout history. Around 161,000 tons of gold have been mined by humans. Gold can be found beneath the earth on all seven continents. It is believed that around 80% of earth's gold is still buried underground. There is an estimated total of 10 billion tons of gold in the world's oceans. That is 25 tons of gold for every cubic mile of seawater. The world’s first gold vending machine was unveiled in May 2010. Located in an ultra-luxury hotel in Abu Dhabi, the vending machine itself is covered in 24-carat gold. Most western economies' currencies were on the gold standard until 1961. Switzerland was the last country whose currency was tied to gold. 40% of a Swiss Franc was backed by gold until Switzerland joined the IMF in 1999. The gold held at Fort Knox is accounted for by the United States as an asset valued at $44.22 per ounce. As of December 31, 1941 Fort Knox held 649.6 million ounces of gold. Today, Fort Knox holds about 147.3 million ounces. The size of a standard gold bar is 7" by 3 and 5/8" by 1 and 3/4"
Alchemists believe they can change ordinary materials, such as lead, into gold. A carat was originally a unit of mass based on the carob seed used by ancient merchants. 17. Elvis Presley owned three cars manufactured by Stutz Motor Company, in which every part that is normally chrome was converted to gold. Former Tyco International CEO Dennis Kozlowski bought a gold-threaded shower curtain worth $6,000. There are 92 naturally occurring elements found in the earth's crust. Gold ranks 58th in rarity. The chemical symbol for gold is Au, which is derived from the Latin word "aurum," which means "shining dawn." The melting point of gold is 2,063 degrees Fahrenheit. Gold is a great conductor of electricity. Gold is the most malleable and ductile pure metal known to man. An ounce of gold can be beaten into a sheet covering 100 square feet. In 1869, two Australians unearthed the world's largest nugget of gold, the "Welcome Stranger," which measured 10 by 25 inches before it was melted down. The largest nugget still in existence is the "Hand of Faith," found in 1980 in Australia. It is currently on display at the Golden Nugget Casino in Las Vegas. A gold nugget found in the earth can be three to four times as valuable as the gold it contains because of its rareness. In 2007, Canada made a 100 kilogram (3,217 troy ounce), 0.99999 gold coin with a face value of $1,000,000. Pure gold does not cause skin irritations. Some sufferers of rheumatoid arthritis receive injections of liquid gold to relieve pain. Olympic gold medals were pure gold until 1912. An ounce of gold can be drawn into a wire 60 miles long. Two thirds of the world's gold comes from South Africa. South Asian jewelry is generally more pure than western jewelry, comprised of 22 carat gold rather than 14 carat. Gold is the state mineral of California and Alaska. 90% of the world's gold mining has been done since the discovery of gold at Sutter's Mill in California in 1848. During the California gold rush, some speculators paid more for an ounce of water than they received for an ounce of gold. South Dakota and Nevada produce more gold than any other states. Scientists believe that gold can be found on Mars, Mercury, and Venus. The visors of astronauts' helmets are coated in a very thin, transparent layer of gold (.000002 inches) that reduces glare and heat from sunlight. The Aztec word for gold, "teocuitatl," was translated by Europeans as meaning "excrement of the gods." According to the legend of El Dorado (the gilded one), an Andean chief who was covered in gold dust would make offerings of gold into a mountain lake. Evidence suggests that around 5,000 B.C., gold and copper became the first metals to be discovered by man. 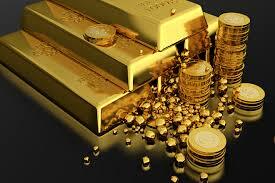 King Croesus of Lydia created the first pure gold coins in 540 B.C. When Franklin Roosevelt raised the price of gold from $20.67 to $35 in 1934, the dollar immediately lost 40% of its value. Henry VIII, Diocletian and Nero were infamous gold debasers, mixing other metals into gold coins and decreasing their value.